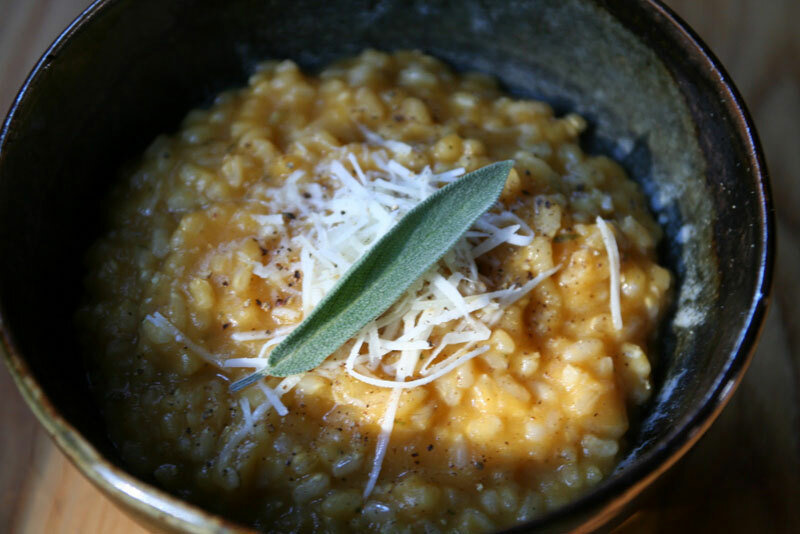 Does the mention of making risotto conjure images of standing at the stove for a half hour, stirring until your arm falls off? What? You don’t love that? Hey, what a coincidence I don’t either! 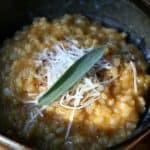 Another gripe: I am sort of a whole-grain freak and I think risotto made with white Arborio rice can seem like a missed opportunity for a great whole-grain meal. I have good news: you can get your whole-grain on, and be a total slacker and go take a shower (or play with your dog/kids) while this risotto cooks. After the rice cooks most of the way, then you stir it for a little while to make the rice release it’s starch. That what gives it risotto’s signature creamy and gooey yum factor. 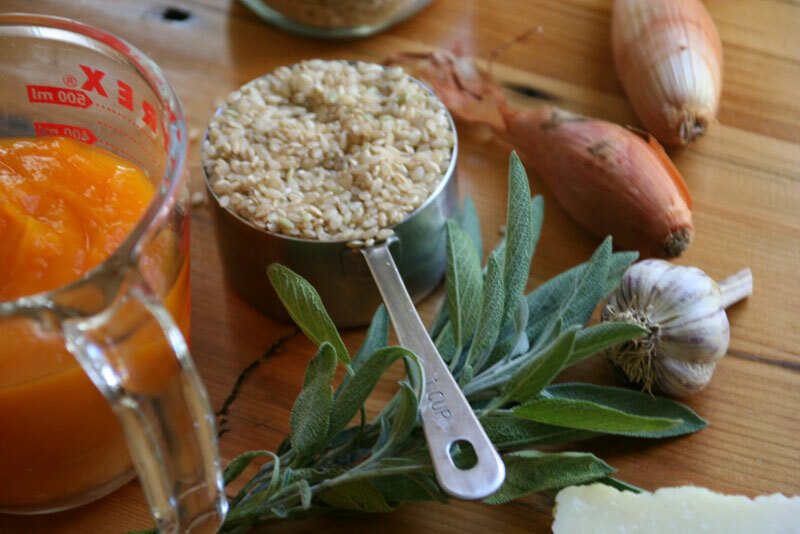 For this recipe you’ll need to get short grain brown rice, like the kind by Lundberg Farms. It is starchier than long grain brown rice so it is better for making creamy risotto. You can find it in the bulk section at the health food store and in larger supermarkets. You’ll also need pureed pumpkin. 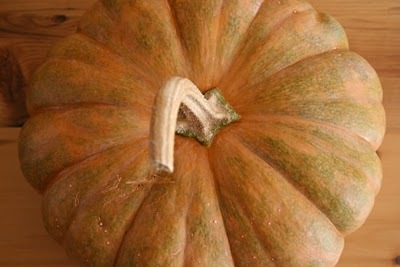 I happened to have a cooking pumpkin from my CSA, so I roasted and pureed it on the weekend and used that. Another time I’ll tell you how I left the roasting pumpkin under the care of my hubby and it almost caught on fire. But I digress. If you are short on time, this recipe works with canned pumpkin. Oh, and also, if you can’t find Pecorino Romano, substitute fresh Parmesan. Stir in wine and cook, stirring often until the wine has mostly evaporated, 2 to 3 minutes. Stir in broth, nutmeg, salt and pepper, increase heat to high and bring to a boil. Cover, reduce heat to low and simmer undisturbed until most of the liquid has been absorbed, 30 minutes. Stir in pumpkin, sage and cinnamon and cook, stirring often until the mixture is thickened and the rice is tender, 10 to 15 minutes. Remove from heat, stir in 3/4 cup Romano cheese, cover and let sit 5 minutes off the heat to thicken further. Serve sprinkled with the remaining 1/4 cup cheese, more freshly ground pepper and sage leaves for garnish.